OMG my life just got awesome. Thank you MightyText. So I was wondering if there was some way to send and receive text messages using my computer. 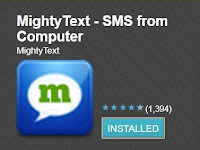 A few seconds of Google Fu turned up an awesome free solution...MightyText. I should stop here and say this is Android only. I don't know of an iPhone app that has this functionality because Apple locks stuff like this down. Yet another reason why I think everyone should have an Android cell phone and an iPad (that's my current setup). Best of both worlds. 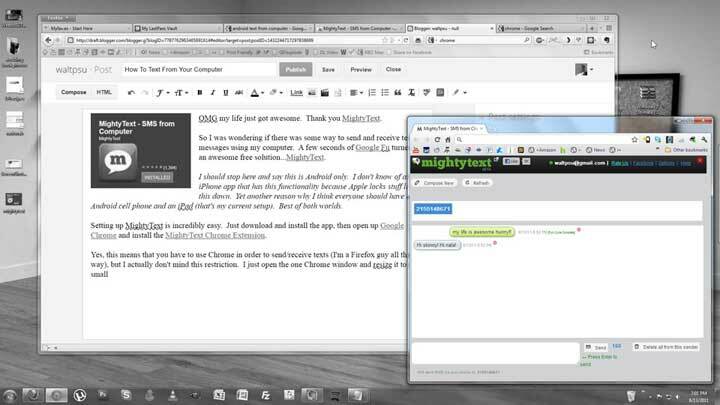 Setting up MightyText is incredibly easy. Just download and install the app, then open up Google Chrome and install the MightyText Chrome Extension. Yes, this means that you have to use Chrome in order to send/receive texts (I'm a Firefox guy all the way), but I actually don't mind this restriction. I just open the one Chrome window and resize it to a small window...it actually makes it feel like a desktop app. I've tried it, I use it, it works seamlessly. I highly recommend it!